Husband was checking out a pigeon’s nest in the corner of our block when a small bird seemed to fly from under his foot. Closer inspection revealed this little burrow at the base of the pig face, Carpobrotus rossii. The bird is the Spotted Pardalote. 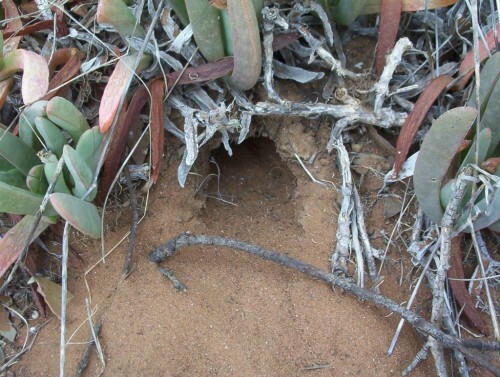 These and Rainbow Bee Eaters make burrows in sandy banks or cliff faces. During the spring and summer we often find scratchings that indicate the beginnings of burrows and it is quite exciting to actually have one being constructed on our place. Husband was able to get a photo of the bird carrying grass to the burrow to line it. The nest is in the middle of the patch of this Pig Face. It is a very hardy plant like all succulents seem to be. I will be planting some of this on the edge of our driveway to create the illusion of ‘lawn’. There is no way that I could keep lawn going there and I wouldn’t want to anyway because it would be a waste of water. Last week I received an email from Stuart in Western Australia at Gardening Tips ‘n’ Ideas. He asked me to be featured on his blog by answering a few questions along the lines of ‘When did I begin Gardening as a hobby, Why have a blog, What useful tip had I picked up along the way, etc. The whole article can be read here. A number of gardeners were asked to fill Stuart’s blog entries for a few days, including a some from the USA. When I looked at what I had written it brought back a lot of memories. The country town we lived in when we were first married had a progressive Parks and Gardens Officer. He began a huge street planting scheme to the extent that this town has a great tree line which is so obvious when compared to the surrounding flat country side of salt bush. These days one would say that mistakes were made regarding species selection but at least there is this lovely greenery in a hot dry area. I joined the Australian Plant Society in 1976. The magazines and Journals that I have kept for the past 30 years are a fantastic resource. When I consider that what was experimental then is now common place regarding propagating and growing Australian native plants, the accumulated knowledge is phenomenal. Why do I write about Australian native plants? They are magical in their colours, shape and form. They fit into any garden type, mixed with exotics or on their own. I find them interesting and exciting plants. Many have unique needs to enable propagation. Many have unique needs to be able to grow them in the garden, especially in this country where climatic conditions are so varied. Our native birds, animals and insects need them to survive and the plants themselves need those birds, animals and insects in order to set seed and survive. The bird life around here is fantastic at the moment. A family of White-winged Choughs often passes through, creating territorial wars with the Little Ravens. Both are feeding young. I had a Blackbird nesting in a stack of pots in my little storage shed. 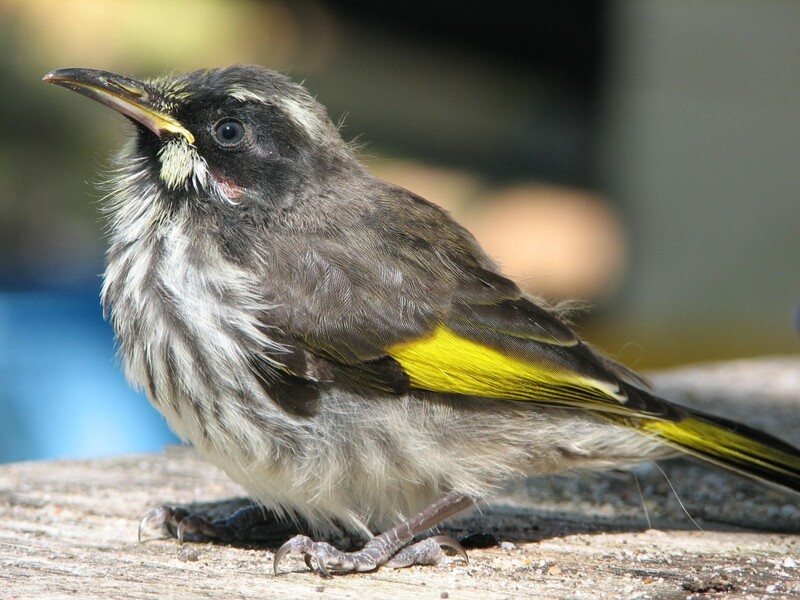 A New Holland Honeyeater is feeding young in a nest in Melaleuca lanceolata near the house. We can watch her coming out to find food and return to the nest from the dining room table. A lot of time gets wasted watching all this activity 😀 . The insect problems around here would be phenomenal if it was not for the bird life on our block. The Rainbow Bee-eaters arrived yesterday. They are such pretty birds. They usually stay until around February. They tend to stay mainly around the creek at the back of our place, where they make their nests in the cliff. While I was sorting plants one of the New Holland Honey-eaters flew past the box of plants snatching a small spider dangling on its web. Husband was really keen on seeing the birds in the Asian Rainforest area as well as the other aviaries at the Zoo. He was able to take some lovely photos. In the smaller aviaries where Australian birds are kept it was, of course, more difficult to take photos with the netting in place. He can’t tick these off his list because of his rule-it has to be seen in the wild to be ticked. However observing helps with identification. What interested me was the increased use of grasses in many of the aviaries. I am still learning to identify the South Australian species which are local, but it appeared that SA species were being used. Because of the height of the plants, the birds were using them for shelter and foraging. Dried grass would have been used for nesting material. There was no seed left on the plants at this time of the year but the birds would have loved the seed panicles last season. Something that I had promised husband was a number of potted grasses to rotate through his aviary for the finches. I must do this for him instead of just talking about it. When the plants become tatty they can be trimmed and tidied, while other pots replace them. He wants to landscape the aviaries, and this would be one way of doing this. We have always had our compatible interests. When we go bird watching we are also plant watching because each is dependent on the other. You are currently browsing the archives for the Birds category.